miss~nances life: Blogtoberfest day 23 - lots of yummy fabric. 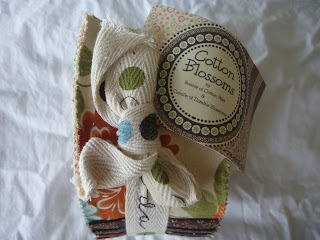 Blogtoberfest day 23 - lots of yummy fabric. 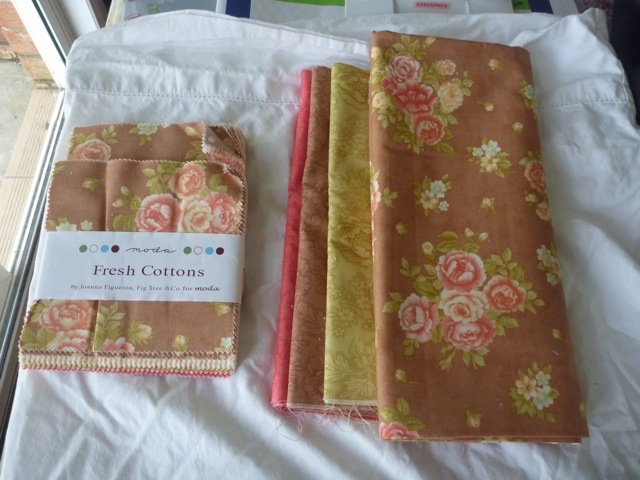 Earlier this week I received in the mail two big bags of fabric . 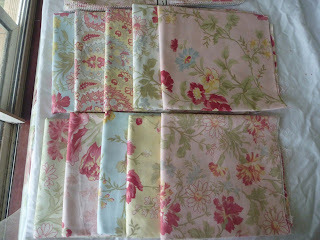 A craft forum friend, Jane, was selling off some of her fabric stash so I went a little mad and bought up BIG. This first fabric has been purchased specifically to make a present for a certain person (can't say too much as I think she may pop in here on occasions to see what I am up to), Will be starting on this project next month so keep an eye out I might do a few teasers. I was very excited when I saw that Jane had some Fig & Plum fabric. I started a quilt at my quilters retreat in August with this fabric & didn't have enough to fit the bed. 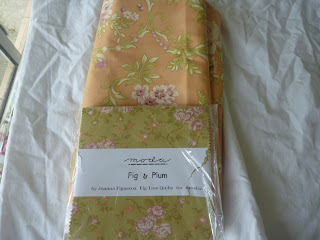 So after i have finished sewing for the fundraiser I am going to finish the quilt with THIS fabric. This will go in the spare bedroom. This fabric is really not my colourings but I think its good sometimes to step outside of your comfort zone. Not sure what this will become yet. But it looks so pretty sitting with my stash. 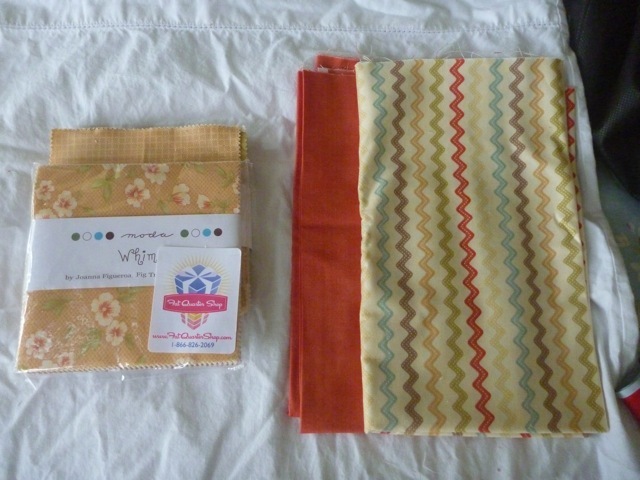 I bought this set purely because I LOVE ric rac and that's what the large piece is - ric rac fabric - how cool. Again no plans for this one but I did find a really nice pattern on the Moda Bake shop for Charming stars quilt - it uses 3 charm packs but I could always just make it a little smaller. How scrumptius is this fabric and it came with 10 (yes 10) matching FQ's. Now this one is likely to be used in a swap but again not going to say too much in case my partner pops in here, but the gift uses 2 Fq's and a charm pack. Although I think the fabric above may be more her colours I don't want to cut up the layer cake to make it. Well I think I just may have to go off and play with my fabric again. I am thinking of putting it in a display basket until I get around to cutting it up. 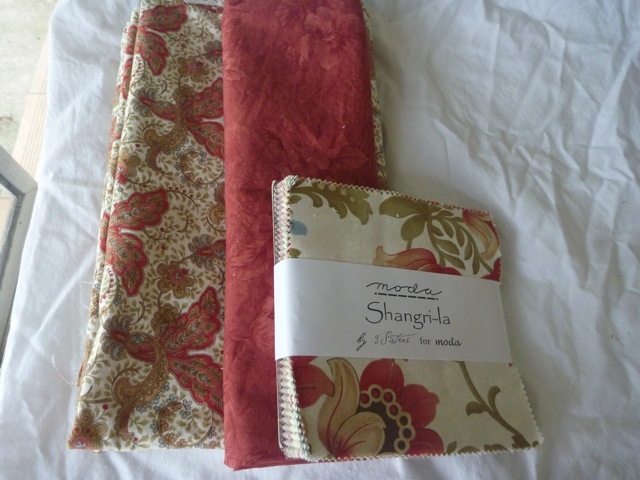 What a delicious array of fabrics!! Lol, I was sdmiring the 'cotton blossoms' but I'd already purchased other fabric so decided against it. Would love to see what you make with it, eventually :). 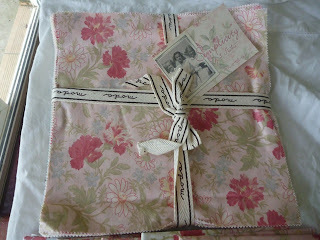 That ric rac fabric is DIVINE! i would definitely have that on display for inspiration and enjoyment! it's gorgeous!